Welcome to the Williston Mall, home of many roadside Karoo treasures. You might think a dusty little Karoo town has nothing more to offer the traveller than a cup of instant coffee and a skanky koeksuster. You’d be dead wrong. Once you’re in the main road of any Karoo dorp you care to mention, park the family car and rootle about. You’ll invariably find a cappuccino den and, more importantly, there will always be something to delight the inner retail lizard. 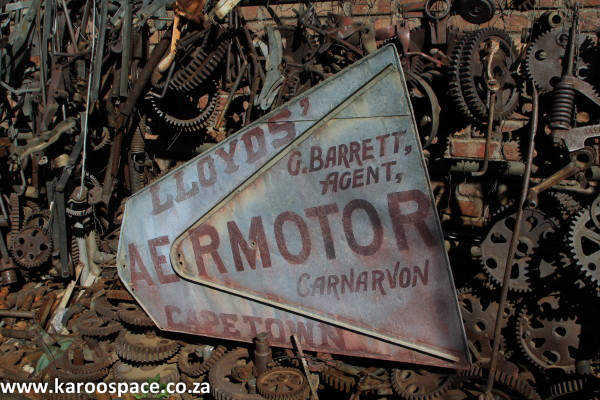 Treasure hunting in the Karoo is all about knowing where the good things are. Here in my neck of the woods – the Eastern Cape town of Cradock – everyone goes bargain-hunting at More4Less, a vast warehouse of second-hand stuff that ranges from racks of Mills & Boon bodice rippers to a no-name brand electric guitar that would sound fantastic in a shearing shed packed with attentive livestock. Everyone eventually ends up at More 4 Less in Cradock. Just more than 50 klicks south on the N10 you find the world-famous Daggaboer Padstal, where the weed is sold out by 6am every day – as the front-door sign announces. This is where you buy your winter woolly sheep slippers, a perfect match for the sherry, the pipe, the roaring fire and that Game of Thrones weekend binge. And if it’s really cold where you live, you can also purchase a snuggly TV blanket made of the finest mohair, shorn from the backs of true Karoo angora goats. Turn in at Cookhouse and make for Somerset East. Knock at the back entrance of the former Catholic church which has a new life as the Angler & Antelope Guest House bar, dining room and fly shop. Alan and Annabelle Hobson will open the door to a world of weird names like Pappa Roach, Woolly Bugger, Hackle Wet Fuzzy Wuzzy, and, lest we forget, the ever-popular Horrible Matuka. You will struggle to find better fishing flies anywhere in the land. Nieu Bethesda – the whole village is a Karoo treasure. Ever westwards we venture, on this voyage of retail discovery. We’ll continue shopping up in the village of Nieu Bethesda where, at The Karoo Lamb, we’ll obtain another pair of very special slippers. These silicon-soled wonders, made of woollen felt, created in the Northern Cape town of Petrusville by a collective of hardy, dynamic women from the local community. They’re perfect for the ‘shoulder seasons’ of autumn and spring because they’re lighter than those Daggaboer Specials currently lurking in your ever-expanding Karoo shopping bag. Slide your foot into a Petrusville slipper and you’ll be a changed person. Luxury for the tootsies. Down south in Graaff-Reinet, we ring the old brass tinkle bell at Eira Maasdorp’s Reinet Antiques. This is like More4Less, only deeper, more cavernous and packed with a mix of true antiques and downright peculiar collectibles. If you see Eira, ask her to show you the oldest cake in the Karoo, which was baked back in 1902. Sophie’s Choice is a must-stop in Willowmore. Further down the N9 pike, in the shadow of the Baviaans, is Sophie’s Choice in Willowmore. Apart from a friendly reception, a good cuppa Joe and a heart-shaped omelette, this is where you load up with angels and chandeliers. Yes indeed. Sophie’s Choice is a favourite with those long-distance BMW bikers you see all around the Karoo. They have the chandeliers and Pan-pipe playing cherubs carefully packed and shipped up-country while they continue their dust road odysseys through South Africa’s heartland. Now that you’ve gathered some of the spoils from our Eastern Cape outposts, let’s cross the border to the big-sky lands of the Northern Cape, where it can get a little crazy from time to time. Up in Philipstown, ask the guy at Merino Motors where you can get a decent draadkarretjie – a wire car. 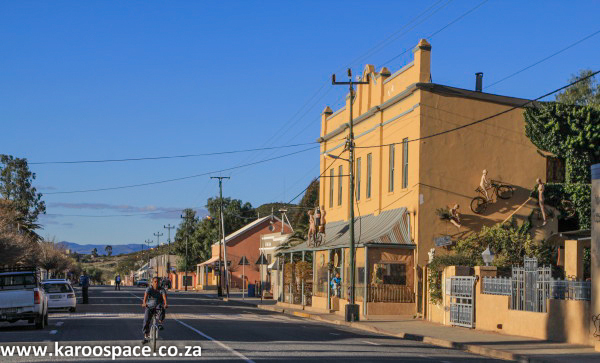 Just like Cradock is famous for its roadside wire windpumps, so Philipstown has been branded the draadkarretjie capital of South Africa. See if you can get your youngsters to set aside all mobile devices for a morning and race each other up and down the driveway with these incredibly intricate and model-correct crafts. Looking for a wind pump tail? Come to Carnarvon. If you’re a windpump fanatic in search of that rare full-size tail, go to Carnarvon and ask anybody where to find Leon Swanepoel, the Water Doctor of the Karoo. The legendary Leon might sell you an Aermotor tail, but if you want to really get him going, you’ll mention your deep love of a Climax windpump. And for God’s sakes, don’t call it a windmill. 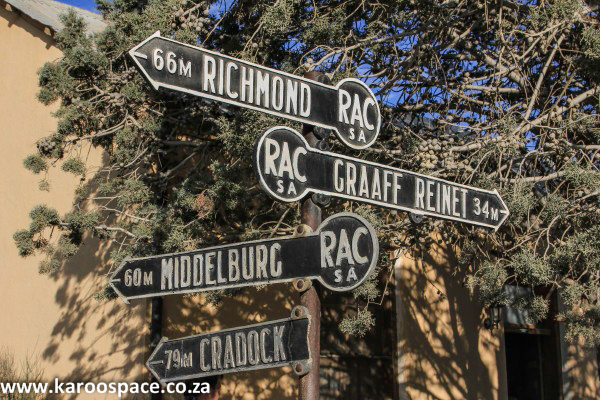 Sliding through Loxton, a very popular Karoo village, stop at the Rooi Granaat if you’re a Deon Meyer fan. He is a part-time Loxton resident, and most of his novels are on sale here – usually signed. Now we’re deep into the Hard Man’s Karoo, and it’s time to stop over at the Williston Mall and savour the best milkshake north of the Huguenot Tunnel. The Williston Mall is, in reality, a home courtyard owned by Pieter and Elmarie Naude. But these two utterly lovely eccentrics, outsider artists to the core, have turned a dusty backyard space in the middle of the desert into a place of humour and funky shopping. 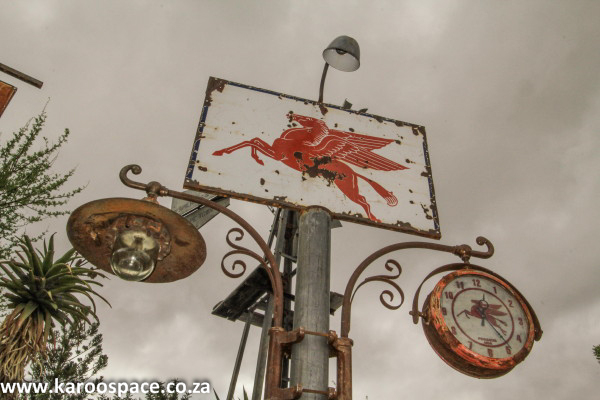 Old enamel signs are becoming as rare as hens’ teeth in the Karoo. This is where you’ll begin to notice the presence of highly-prized antique enamel signs. You used to be able to pick them up for a song. Nowadays, they’re almost priceless. 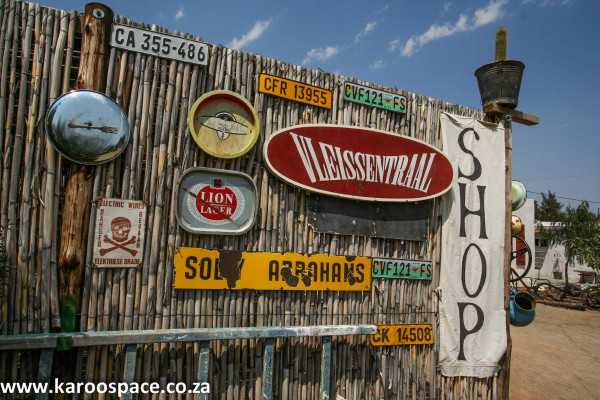 Offer Pieter money for one of his signs and he’ll laugh and point you westwards, to Dirk van Rensburg’s Rustic Art Shop in Calvinia. 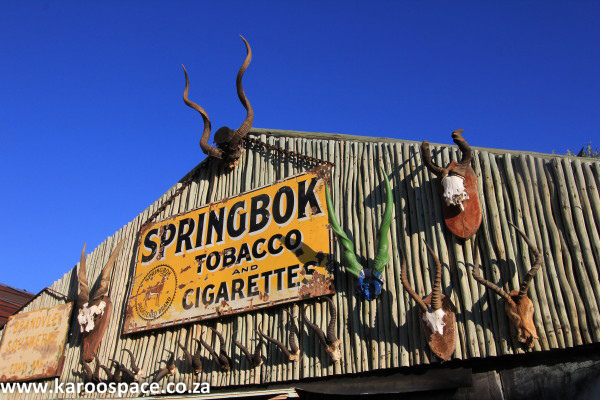 Offer that old hippy baker Van Rensburg money for his glorious Springbok Tobacco enamel sign and he’ll change the subject immediately. If you’re lucky, you’ll emerge from a Van Rensburg transaction with a discounted Oom Daan’s Pie. These hot delicacies carry a money-back guarantee, should you get meat pie-induced heartburn. Not far from Middelpos is the starry village of Sutherland, where you should pop into the local farmers’ co-op. 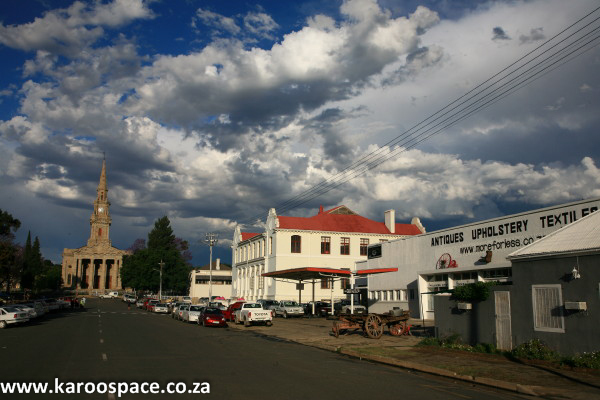 We have a friend in Prince Albert who reckons that small town Pep Stores are the Woolworths of the Karoo. I disagree. I think a good Karoo co-op is just the place to shop. You see that bottle of udder cream on the third shelf to the left of the two-tone shirts? Insiders will tell you udder cream is fantastic for chapped hands. And if you buy any item of clothing or footwear bearing the name of Jonsson, know that you will be wearing it for many years to come. The stuff is as hardy as hell. All my old Jo’burg brand-name clobber has been replaced by Jonsson, Jonsson and yes, a bit more Jonsson. But I’ve kept the best for last, and this shop is to be found in the Great Karoo town of Beaufort West. Petroliana on display at Die Spinwiel in Beaufort West. Down the main drag, just near the oddly-sited local prison, you’ll see a small sign saying Die Spinwiel Antieks. Welcome to the Karoo’s Cave of Wonders. As you walk in, you see a regulation antique shop. Go further, and it suddenly becomes a massive museum to the popular culture of yesterday’s Karoo. The story goes that they have more Mazzawattee tea tins here than anywhere else in the world. Toby Jugs, all manner of juke box, loads of enamel signs, miniatures, a barber’s chair and even an ancient Polyphone gambling machine that once graced the foyer of the Fraserburg Hotel. Apart from the front section of for-sale antiques, the rest of Die Spinwiel is purely for your gawking pleasure. And before you think you’ve seen it all, step out back into the courtyard. Here you’ll find the Street of Old Petrol. Here’s a fully reconstructed Atlantic filling station, opposite its Shell counterpart. Look, here’s the Caltex White Rabbit, and the Trek Quagga. Die Spinwiel eats up most of your morning, and I haven’t even shown you the MC Ellis Bicycle Shop down the road yet. But no matter. The jammy is fully packed with lots of loot (including the Horrible Matuka) and we’ve just had ourselves the most badass, fun-filled Karoo road trip anyone ever dreamt of – without having to yank out the Green Mamba passport once. 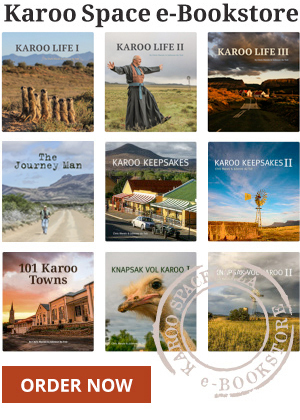 Graveyards of the Karoo 21 Pubs of the Karoo Karoo Road Trip on Route 63 Road Tripping in the Eastern Cape Karoo Winter Travel Routes in the Eastern Cape Karoo A New Karoo Book Hits the Road A Story Behind Every Karoo Farm Karoo Keepsakes II: Rock ‘n Roll Across the Northern Cape!